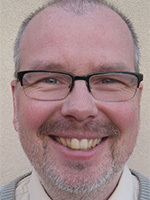 Reiner Martens is a Ph.D. student at UNM in the OLIS department. Reiner speaks three languages and taught Mathematics at Cleveland High School in Rio Rancho. He is interested in the field of learning, lean manufacturing and motorcycles. Reiner oversees the daily operations of the ECE Department. He handles all administrative and management issues, personnel hiring and contracting, as well as the preparation of various departmental and institutional reports.